BlackBerry-maker Research In Motion (RIM) hits the press on an almost daily basis, quite often with negative headlines over positive news. BlackBerry’s market share was long overtaken by Android in the US, but in Asia things are different. Earlier today, we reported that RIM published a video to thank its fans across Asia, and it is in Southeast Asia where the company enjoys its greatest smartphone market presence. There, BlackBerry is ahead of Android, Apple, Nokia and others in Indonesia, the Philippines and Thailand, while it also holds strong positions in other neighbouring countries. Case in point: there was a stampede in Jakarta, Indonesia’s capital, when BlackBerry launched its new BlackBerry 9790 handset. More than 3,000 fans gathered but things got ugly after a mix-up, with those queuing getting violent when they realised that they wouldn’t get the device on discount. Subsequently police investigated the events and criticised the company for the chaos, but it proved there is huge demand. 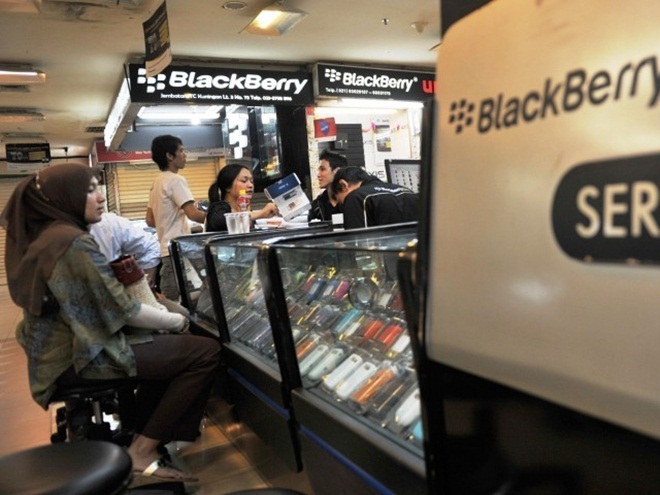 RIM has also opened dedicated retail stores in Jakarta and Thailand’s capital city Bangkok, where fans go crazy for the smartphones. However, with Asia now a prime battlefield for smartphone-makers that have realised the potential in the region, RIM is being challenged on all fronts and this year is likely to mark a downturn in its successes in Southeast Asia. Why is BlackBerry so popular in Southeast Asia? There are a number of reasons for RIM’s strength in Asia. For one, it was the first on the smartphone scene in many markets, as it emerged before Android-based handsets or Apple had begun their international roll-outs into these markets, and this advantage helped it embed itself within the region. Since then, it has sustained is momentum across the area against its competitors thanks to its competitive pricing and, more importantly, its BlackBerry Messenger (BBM) service. BBM is the glue that keeps BlackBerry strong in many of its most successful markets. RIM used its first mover advantage, and endorsements with celebrities, to promote its devices and BBM to the public, and it successfully found its way into the consumer space, albeit at a time when smartphone ownership was low. Having established itself amongst phone users, BBM has become a key communication tool for many even since the iPhone and Android devices arrived in the region. It is not uncommon to see some affluent Thais or Indonesians sporting a BlackBerry and an iPhone, such is the importance of BBM for keeping in touch. For those less affluent, cost is still a major factor and it plays into RIM’s hands. In Thailand, for example, a low-end BlackBerry can be bought for upwards of 6,000 THB (around $189), which compares favourably to Apple, as the iPhone 4S is available from 20,900 THB (circa $660). Even higher-end devices from RIM are cheaper than the iPhone and, though the growth of Android is putting a spanner in the works, BlackBerry is seeing fiercer rival for sales than ever. The development of the iPhone has see Apple products grow in emerging Asian markets where BlackBerry enjoys significant traction. While many phone users do not own the latest iPhone 4S, the combination of Apple devices — and in particular the iPhone 3GS and iPhone 4 – is increasing Apple’s market share. Apple is continuing to manufacture older devices as they can provide a less costly alternative that competes with mid-range smartphones from its rivals. Apple has a growing brand in Asia, where its high cost is seen as evidence of its superior quality, and there is no doubt that, with its tail of devices growing longer, it can steal more market-share from BlackBerry. If Apple can cut device subsidisation deals with operators, as it has just done for the first time in China with Unicom, then it is likely to extend the reach of its devices in Southeast Asia. While it isn’t about to overtake BlackBerry any time soon, it might see high- and mid-range BlackBerry owners switch over in greater numbers. A more obvious threat to BlackBerry in Southeast Asia is Android. The Google-owned operating system has seen shipments to Southeast Asia triple during 2011, and Asian countries dominated Google’s app download rankings. While it is true that Android devices do not support BBM, the growth of cross-platform messaging apps like WhatsApp and Kakao Talk (which we looked at recently), and even social media too, is helping BlackBerry users realise that they needn’t be dependent on BBM to chat without SMS. Outside of messaging, Android’s sheer range of devices, which start from less than the cost of a BlackBerry and go up to match the iPhone’s prices, provides with a viable alternative to BlackBerry for those looking for a taste of ‘real’ apps. There is no doubt that RIM’s app ecosystem is way behind Android and light years behind Apple. While the industry debates whether developers will begin to favour Android over iOS in six months, as Eric Schmidt believes, BlackBerry doesn’t even enter the equation. RIM is reported to be considering a move to license its operating system, which would crucially include BBM. This cannot be dismissed as hearsay as it has similarities with the company’s move to license its corporate device management system for other operating systems, but it would have dire consequences for the company’s market share in Asia. With BBM arguably the sole differentiator over its rivals, a move to open BBM would see the gap between BlackBerry and its rivals disappear at a far greater pace than many are predicting that it will. Sea changes take time to come about, but the growing threat of Android and Apple has been developing in Asia for some time. RIM doesn’t typically unveil statistics about usage but, from anecdotal evidence and living in BlackBerry-dominated markets, Southeast Asians are abandoning BlackBerry for alternatives, or buying other devices ahead of RIM’s smartphones, in greater numbers than ever before. Last year was a difficult one for RIM in Indonesia, as this AFP editorial (via Yahoo) investigates in detail. The company battled with the government after it chose to locate a new factory in Malaysia, while Indonesian authorities pressured it into developing a local server, and other issues. Gregory Wade, who is the managing director of RIM in Southeast Asia, called Indonesia “a very important market for RIM” and it is no coincidence that the global launch of its most recent smartphone was held in the country, with co-CEO Jim Balsilie flying in for the occasion. However, Indonesian consumers are beginning to explore other alternatives to BlackBerry, as both the Jakarta Globe and the BBC found last year, and consumer habits have only advanced since then. Elsewhere in the region, users are looking for alternatives too, however — with a population of 240 million — Indonesia is the big market. Smartphone sales are tipped to reach 164 million across Southeast Asia this year, up from 106 million in 2011, and as the markets continues to grow, RIM’s share is likely to dilute at the expense of its rivals. While it may just cling on to its smartphone leadership in its biggest markets this year, make no mistake that this is the beginning of the end for BlackBerry in Southeast Asia.